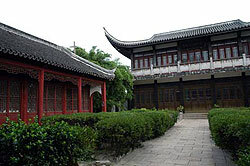 Qingpu has a dynamic tourist industry. It is home to Dianshanhu Lake, Shanghai’s largest freshwater lake and the source of the Huangpu River. The 1,700-year-old riverside town of Zhujiajiao is a picturesque village with rustic stone bridges and historical buildings, now used as banks, spice stores, rice shops and even a post office. These ancient buildings also continue to be homes for residents, as they were for centuries past. Another popular destination is Qingpu’s oldest town, Baihe, best known for its Shanghai opera performances, locally called “huju”. Qingpu is now a popular residential area, and there’s been an influx of shops, restaurants, schools and western-style homes. Qinpu combines reasonable land prices with convenience, and is close to major highways. Many Qingpu residents live in a friendly area along Huqingping Road.